Su Jingping, a radio talk show host in Beijing, has two objects - a small copper bell and a small piece of wood - that he now calls his "most precious treasures." Between February 16 and 24, Su paid a visit to the Nujiang River, one of the last pristine rivers in this, the world's most populous country, with 19 other environmentalists like himself. His two "precious treasures" are items he acquired on the trip, which was organized by several non-governmental environmental protection organizations. The bell was once tied around a horse's neck, while he found the piece of wood stuck in the pebbles in the bed of the Nujiang River and worn into an interesting shape by the action of the water over the years. Of course, much more than just these two small objects was brought back by Su and his companions. They took more than 1,000 photographs along the river, which flows from north to south in the western part of Yunnan Province, in Southwest China, recording with their cameras the extreme beauty of the area and the living conditions of the local people, whose lives bear little sign of change over the past 100 years. They have carefully selected 150 of their very best photographs to put on display in the Jianguomen post office in Beijing, with the mini-exhibition running until this coming Wednesday. Their intent in holding such an exhibition is to share with the public the wonders of their trip, as well as to boost the public's awareness of this virgin area. Two little girls of the Lisu Minority bathe in a mountain pool in the Nujiang River Vally. The Nujiang River has never been a popular tourism destination. Even those who see themselves as informed travellers, much better informed than the general mass of tourists, would likely miss much that the area has to offer. Travelling in Yunnan they would more likely choose Dali - the capital of the ancient Nanzhao Kingdom, the Jade Dragon Snow Mountain in Lijiang, or Xishuangbanna as the best places to visit. The Nujiang River is usually passed over "maybe because it is harder to get to," said environmentalist Li Bo, one of Su's travelling companions. From its headwaters on the southern slope of Tanggula Mountain on the Qinghai-Tibet Plateau, the Nujiang River runs through one of China's most remote areas, where it has carved canyons through the rugged mountain ranges east of the Himalayas. In a distance of 742 kilometres, it descends 1,578 metres, plunging through gorges like a roller coaster. It is one of the most challenging areas in the world for travellers. "The scenery there is so utterly spectacular that all of us were overwhelmed," said Li. He is currently working for Conservation International, a United States-based environmental protection organization, and also for a local centre for biodiversity and indigenous knowledge. The avid environmentalist is a native of Yunnan and has visited the area several times before. He says that every time he sees the river's canyon a new feeling of awe creeps over him. The river runs through gorges unlike any others in the country, moving many to call it "the Grand Canyon of the Orient." The area boasts one of the world's most special canyon environments. For the same reason that the area scares away ordinary travellers, it has become a holy land for botanists, zoologists and explorers. Having been traversed by so few, the valley area preserves well the original ecological environment. According to Wang Yongchen, one of the organizers of the event, the Nujiang River flows through a region that is home to virgin forests, 7,000 species of plants and 80 rare or endangered animal species. "At least one quarter of China's indigenous plant species and half of its native animal species can be found there," Li Bo said. It is one of the most biodiverse regions in the world. The Nujiang River is not alone. It is one of the family of rivers flowing out of the Qinghai-Tibet Plateau to feed some of the most important waterways in Asia - the Nujiang River, the Lancang River and the Jinsha River, which run beside each other. For this reason, the area, which has been designated a World Heritage Site by the United Nations, is named the "Three Parallel Rivers" area. The Nujiang River is one of the two rivers in the country that have never been dammed, the other one being the Yarlung Zangbo, in the south of the Tibet Autonomous Region. According to development plans for the river, however, some dams are scheduled to be built for power generation. Scientists and environmental conservationists are debating the advisability of such plans. Members of a local family in the Nujiang River Valley chat with visitors. The Family has tibetan, Lisu, Nu and Dulong Ethnic minority blood in its veins. What struck Su Jingping and his companions the most was not the natural scenery, but the people living in the region. "There were villages on mountain ridges above the Nujiang River. The highest villages seem to hang from the clouds," said Li Bo, adding that he was deeply impressed with the Spartan life of the local people and the reassuring harmony between human beings and nature. "Many local farmers enjoy their quiet life very much. Sometimes we found ourselves wondering why the local people built their homes in such high places," Li said. He said this made him re-examine his thinking on a lot of things. He found himself wondering whether the local farmers needed modernization to improve their living standards, which would destroy their pristine and easygoing life-style. Li still remembers an experience in a village called "Peach Blossom Island" in the township of Bingzhongluo. There he asked a local villager whether he would like to own a car. The villager said "no." For him, that "the livestock do not fall sick" matters much more than owning a car. Besides the biodiversity, the travellers were also impressed with the cultural diversity. The area is home to 22 minorities, including the Naxi, Lisu, Tibetan, Bai and Yi ethnic groups. These minority groups all have their own unique languages and folk customs. 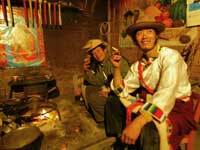 In the township of Bingzhongluo, Li talked with a 27-year-old Tibetan man, who is married and has two children. He lives with the family of his wife, a situation regarded as humiliating in traditional Han Chinese culture. "But in Bingzhongluo it is common for men to live with their parents-in-law," said Li Bo, who himself is of Bai ethnic origin.